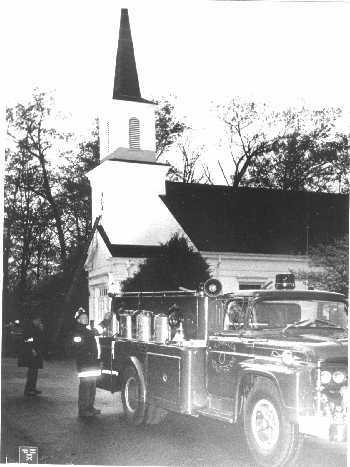 Help identify firefighters, apparatus, and year taken: E-mail the page author. Above left: Around 1970. L to R, Gerry Damstrom, Neil Devries, Jack Devries, "Skip" Friend, Jack Savage, Ernie Casper. 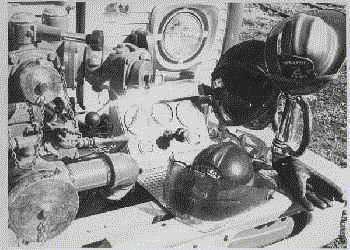 Dutch Kishbaugh is in the cab of Truck 11, 1969 Hahn. Above right: When? 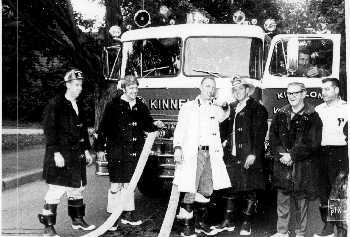 Unidentified chief with Jack Devries and Howard Roughgarden at the pump (see also below) of Truck 22. Left: When? Joe Pavlak (or is it Ralph Hunt?) is retrieving equipment from Truck 1 in front of Smoke Rise Community Church. Jim Maher is in the darkness behind him puffing on a cigarette. Photos furnished by Justin Muldoon. Taken by Harry Hicks. "Old 11" was a 1969 Hahn with Waukeshau gasoline engine and manual transmission. It had a 750gpm pump and carried 1,500 gallons of water. 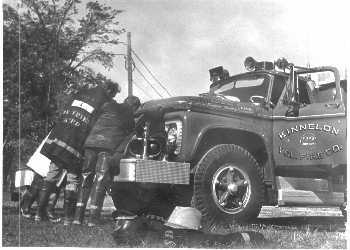 "Old 22" was a 1964 Ford with fire truck conversion done by a shop on Cannonball Road in Pompton Lakes. Walt Holterman did much of the design layout. It carried 1,250 gallons of water and had a front mounted Hale 750gpm pump. "Old 1 and 3" were sister trucks, built in 1960. These Fords were built by H & H of Jersey City. 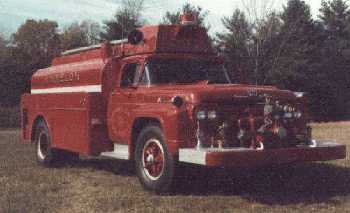 They had front mounted Hale 500gpm pumps, 2 speed rear axles and vacuum assist mechanical brakes. No power steering. is still on duty: at the Green Pond, NJ VFD.